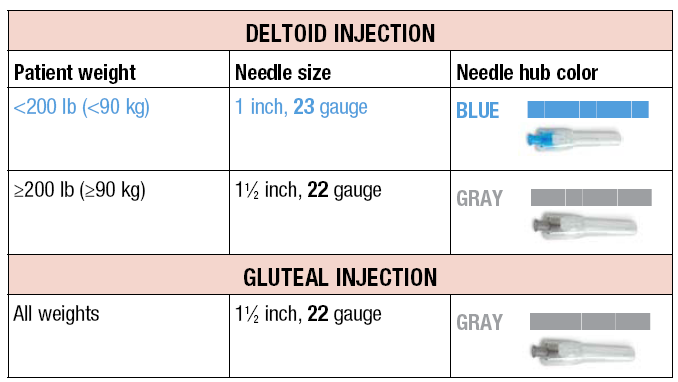 The recommended needle size for administration of INVEGA SUSTENNA® into the deltoid muscle is determined by the patient's weight. For patients weighing less than 90 kg, the 1-inch, 23 gauge needle is recommended. For patients weighing 90 kg or more, the 1½-inch, 22 gauge needle is recommended. The recommended needle size for administration of INVEGA SUSTENNA® into the gluteal muscle is the 1½-inch, 22 gauge needle.